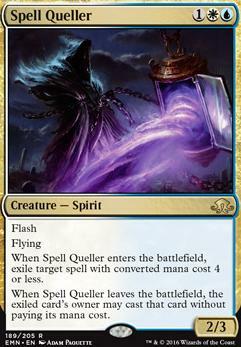 If I flicker spell queller will it counter the spell it exiled? Does enter the battlefield effects still go off if my opponent plays a Spell Queller? This looks like so much fun. What about Reflector Mage or Spell Queller ? Thanks! I pretty much own all of it, too, which makes it tempting to build. I'm missing 4 Spell Queller , 2 Settle the Wreckage , Esper Charm , Seachrome Coast . It feels way better than Grixis these days. The 2 Creeping Tar Pit are bad enough for tapped mana. And I never want 6 lands in play for Colonnade. And fast lands are nice to save some life vs the aggressive meta. Since you play BGx, do you have any ideas for approaching the grindy decks? 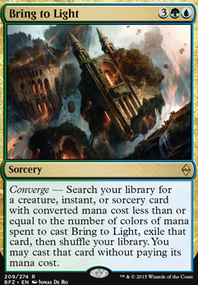 This morning I remembered that I'm in the colors for Lingering Souls , which could be decent sideboard tech vs UW and BGx. The grixis Snapcaster Mage / Kolaghan's Command engine was so good in those matchups, but without it I think I'm unfavored. 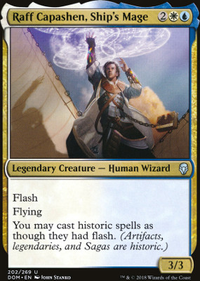 Squirrelbacon: I'll test out 2 copies of Snapcaster Mage at some point and see how it plays. 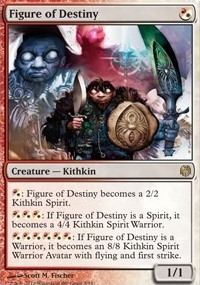 Heroic Reinforcements , like Jeskai Charm , is probably a bit too cute, but also allows for a swing of 9 points of damage with either just Hero or Pyro out. Like snappy, I think it is worth testing at least. As someone who has also played Geist of Saint Traft and Spell Queller in the same deck, I agree it can be awkward sometimes. But usually I find that it is highly situational on which is the correct to play. There is no hard rule about which one you should play on turn 3 as it'll depend on a lot of factors, your opponent's board state and deck for example, on which is going to end up being correct. 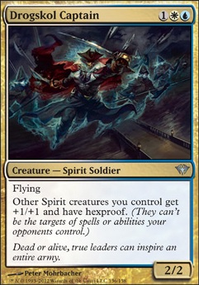 Also, Geist excels mostly against combo decks and is still an extra, and I'd say necessary threat, against control. Eidolon of the Great Revel is an interesting sideboard card and probably worth considering if Storm's meta game share goes up. 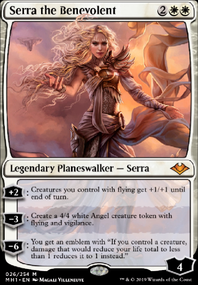 Same with Render Silent , it's a personal favorite of mine in EDH as well. 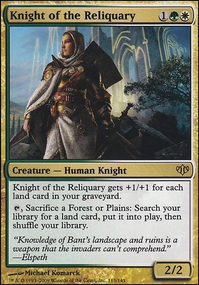 I love discussing decks and card ideas with people, we may not always agree on everything, but it is always worth figuring out what cards are worth testing or not, especially with a brew like this. I definitely support you experimenting in over ! I think that the aggro potential in Jeskai is often overlooked and the color combination just gets clumped in with control too often. Maybe rightfully so, as many of the cards support a more controlling play style, but there is also the potential to be a glorified burn deck at times. That said, I know that you felt Snappy may feel a bit slow for this deck but I highly suggest trying him! For this type of deck, he is NOT a four of, I'd suggest 2 or 3 though. Access for both Bolt and Helix just allow you to quickly slam through a minimum of 6 points of damage quickly... Plus then factor in playing several copies of Boros Charm and you're talking a lot of upside for Snapcaster. Again though, I would not recommend 4 with such an aggressive list. In regard to Heroic Reinforcements , I don't know how I feel about this one. It makes sense, however, by itself it's extremely inefficient. 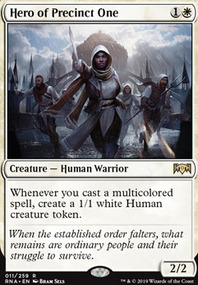 If you don't have a token producer in play, I'd assume it would just feel very underwhelming... and considering how much removal is in the format I don't think I'd bet on a 2/1 lasting more than 2 or 3 turns to consistently enough support Heroic Reinforcements . The way I see this deck winning is by going quickly and making 2 or 3 tokens, then burning out the opponent for the last 7-10 life points. A 4-drop that at worst makes two 2/2's doesn't seem strong enough. The Path to Exile argument is very fair, I'd suggest keeping an eye on it though. Might feel like too many, especially if you decide to add in a few snaps. Understandable reasoning though! I also wanted to ask you about a few other creatures, namely Spell Queller and Geist of Saint Traft . As someone who has extensively played both of these cards, and tried to play them in the same list before, the end result also seems... exceptionally clunky. Both being 3-drops can determine how the game goes, as Spell Queller is reactive and Geist is proactive. They want to do different things and don't often play well with one another. They can be great together, but most of the time when you have one, you don't want the other since it tries to make you change the game plan that was originally set up. Also, I'd suggest putting Geist in the main if you want to run him. Board wipes are his worst enemy, and after game one against a deck like yours, you'll see a lot more board wipes post board. Spell Queller does great against board wipes since it exiles the spell (think Supreme Verdict ) and can stall out for tokens when the a sweeper is introduced. Also for the side, you may want to consider running Eidolon of the Great Revel or Render Silent . I've got a feeling storm will be one of your worst match ups, and both of those cards just HOSE storm players. It's a ton of fun for those matches to sit with some shields up! I'll be on a bit later tonight and the weekend, so we can keep going over other cards as well and my opinions on stuff. I like how it looks though so far! Keep in mind, everything I say is an opinion and I'm not trying to force anything.... I just like going over reasoning behind cards and ideas with other people, feel free to ignore anything I say!